I made four of these laser cut music boxes as Christmas gifts to my family. 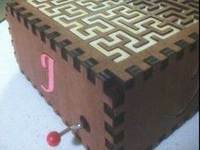 The lid contains an inlaid Hilbert space-filling curve. On each of the sides is a colorful J, representing each of my four family members (our names all begin with that letter). The Hilbert curve on the box is derived from the same Hilbert curve sketch I posted here a few weeks ago. In fact, the design of the entire box was generated via a single Processing sketch that I wrote. You can get a copy of the sketch, as well as the plans for the box at Thingiverse.